Soon enough it will be Winter. Again a landscape covered with white powdery snow will reveal where travelers want to go. 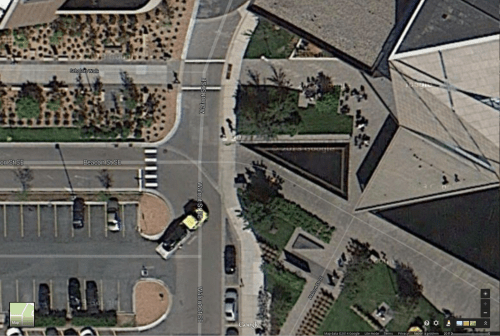 The first figure is an aerial shot of the former environment around the McNamara Alumni Center on the University of Minnesota campus. The second figure is in front of (behind) McNamara . Though there is a sidewalk just on the right of this image, pedestrians prefer the straight line path between the Scholars Walk and the diagonal path across Walnut from Beacon Street to the intersection of Oak Street and Washington Avenue. And why shouldn’t they? It’s cold outside. 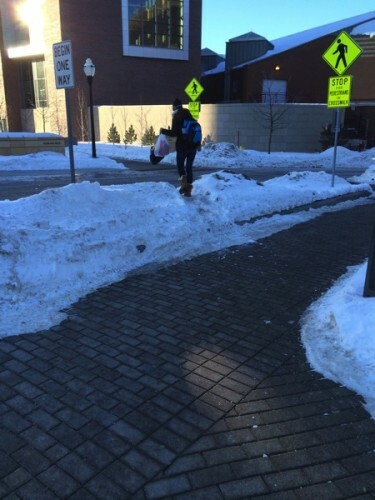 The extra few feet (extra few seconds) are not worth it, even for a cleared path. Prioritize pedestrian movement over other modes of travel whenever possible. travel, with walking as the highest priority followed by bicycling, transit, and private vehicles. So you would think when a desire line emerges, it would be considered for improvement since it is evidence of a direct route. Certainly you would think direct paths would be preserved rather than removed. 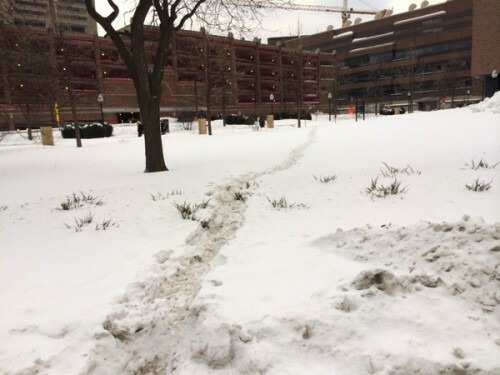 Sadly, this desire line used to be the regular sidewalk path until recent landscaping work done at the McNamara Alumni Center. But the people (well about 20% of the people based on my springtime count) could not be kept down by a mere four inches of concrete, they rebelled, in the typically passive-aggressive Minnesota way, by walking across the desire line rather than the rat run of the planner, especially in Winter when the curb is so conveniently hidden under snow, but even in summer, when there were dying plantings showing the ineffectiveness of the curb. Still, I complained to campus facilities staff about the remodeling (1) making it a worse pedestrian condition, and (2) flying in the face of the campus master plan. I am told this change was to slow down bicyclists coming from Washington Avenue to the Scholars Walk. I personally never noticed much of a bicyclist problem on the Scholars Walk, and there is Beacon Street right next door (and now Washington Avenue Mall a block away) so I doubt this will continue to be a significant problem. But perhaps a regent encountered a bicyclist. I am also told that this was not a University of Minnesota, but a University of Minnesota Foundation decision. See the distinction? Me neither, and I work there. They share the umn.edu domain and the Foundation Board is in part appointed by the Regents. I am sure this is important for tax purposes or some such. A tree! That’s how we solve a desire line. Staff said they would try to get this fixed. 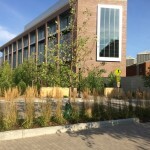 In spring I even met onsite with a campus planner, who agreed there were better solutions. This summer there was to be work here (to fix some poor construction in the remodel I am told), so there was an opportunity to rectify the situation. Thus I am surprised to see at the end of this past summer a tree planted where once there was a path, and later a desire line despite curbs aimed nominally at slowing bicyclists and actually just extending the trip of pedestrians (if not increasing the likelihood of their tripping). Now I like trees, but I don’t see them being planted in the middle of streets. So why is it planted where once there was a sidewalk? 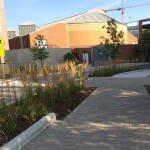 Here we have a tree giving the figurative finger to pedestrians who want to take the most direct route between major destinations (like the Stadium Village Campus Connector Bus Stop on Oak Street and the East Bank of Campus, for instance) in direct contravention of the guidelines of the University’s officially adopted plans. 1. If 1200 people are each delayed three seconds, that is 1 person hour per day that is lost. I don’t know the pedestrian count, but that seems the right order of magnitude. (I know, this is America, and we don’t value the pedestrian’s time). That Nano/Rec Ctr one is the worst. I couldn’t believe it was ultimately going to remain like that until it finally did. 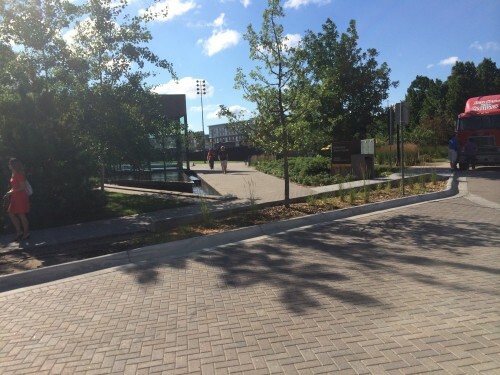 People are fighting to make cow paths permanent/safe at future SWLRT West Lake Station too. Too bad our transit planners/designers are like hwy engrs of old.